You are invited to the Missie Cindz ‘s seasonal pudding club on 17th September 2011, held in The Rutland Arms (upstairs) 4.00pm – 6.00pm, where you will be able to indulge in a sweet ‘5 course’ pudding set menu. Each event will be based on a theme, Autumn’s theme being based on ‘favourites’ – what’s your favourite pudding of all time? Let us know and you could find it served up to dig in! To book a place and smiley spoon, tickets and bookings will be available from 22nd August. Tickets priced £4.00 per person. Purchase tickets from the Rutland Arms bar, the event venue (Brown Street, Sheffield) or send Cindy Cheung, the event organiser (and Pud Lover), an email to: puddingclub@missiecindz.com to book your spoon. Please allow 24 hrs for email confirmation of your booking. Your place/places are not guaranteed until you receive this email. Places are limited so please book early. 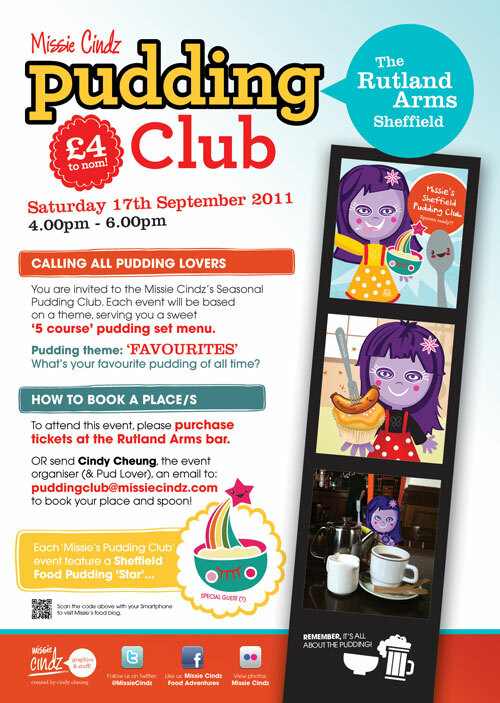 I liked the idea of a Pudding Club because it’s socially fun and you can chat to people over mouthfuls of sweet goodness. Each ‘Missie Pudding Club’ event will also feature a Sheffield Food Pudding ‘Star’ (woooo hoooo, I hear you all whistle and clap!? :), this will be a pudding made by an artisan, independent food producer/business based in the Sheffield area. @ginger_bred treacle sponge/treacle tart but I also love key lime pie. @CU84 favourite pudding? Warm chocolate brownie with vanilla ice cream. Simple but heavenly! @julia_design chocolate cheesecake :) yum! @RuthEHawke sticky toffee pudding or marble cheesecake or New York cheesecake. Ok, there’s three! @Yummie_Cakes New York cheesecake, mmmmm nom nom nom! @kittykanzashi Tricky! If the pudding can be served with custard then I want it.